Convince mums that Safeguard Pure White Body Wash is the ultimate protection against germs and bacteria for their entire family. As children grow and get more active, exploring the world around them more and more, mums increasingly recognize the need to protect them from nasty germs and bacteria. 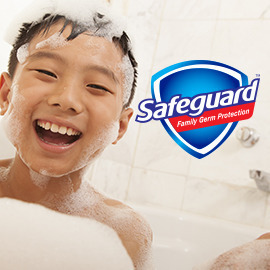 Safeguard Pure White is an anti-bacterial body wash for the whole family that empowers mothers all over the world with its superior germ protection, as it not only removes 99% of germs, it protects the skin’s moisture shield so that germs can’t easily attach. How can you bring to life the claim of "unbeatable germ protection that maintains the moisture shield " in an interesting and clutter-breaking way.